From our combined work and personal experiences, we created a conversation guide to help individuals, families and groups think about healthcare needs and begin meaningful conversations about a difficult topic. We call it “Elephant in the Rööm™.” Our Elephant is a set of 96 cards in four categories of scenarios and questions for consideration and discussion. This is NOT a game by any means. Talking about healthcare changes, aging concerns, and death/dying is scary to many people and something most would rather avoid. 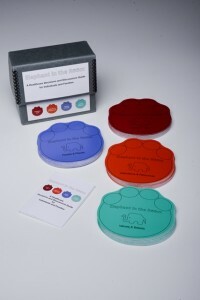 We’ve tried to lighten the approach a bit with colorful cards in the shape of an elephant’s footprint to be less threatening and more engaging for people of all ages and stages in life. By using Elephant in the Rööm™ each individual can confirm their preferences, enhance communication with their family and healthcare team, provide time for family and other loved ones to understand decisions, and relieve uncertainty or guilt about decision-making. These are personal conversations, not medical consultations, and they will require a loving commitment of time and attention from all involved. Elephant in the Rööm™ can help people begin these important personal conversations. You CAN talk about this! We invite you to learn more about Elephant in the Rööm™. View our Elephant’s website and storefront. Help your family tackle the elephant in your room!